Before we explain all about the arbah minim, I should like to introduce myself. My name is Rabbi Sholom Hecht, the youngest of six brothers, all Rabbis, American born to an American born father who’s father arrived to the shores of the United States in 1880. After establishing my business in 1961 of selling religious articles, giftware, and esrogim (from Israel and Italy), both wholesale and retail in the Flatbush section of Brooklyn, New York, I was approached by my mentor and Rabbi, Rabbi Israel Jacobson (of blessed memory) to become his partner in the “Yanover Esrogim” (from Calabria, Italy) being that he was getting on in years and the work was becoming difficult for him to manage. A SHORT HISTORY: He was the first person to travel to Italy after WWII under the directive of the previous Lubavitcher Rebbe, Rabbi Joseph I. Schneerson ob”m, where he contacted a Mr. Cray, a prominent Italian Jew who was well acquainted with the esrogim and provided the previous Rebbe with esrogim for himself and for the family while he resided in Europe. 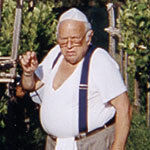 After that, Rabbi Jacobson became the first importer of “Yanover Esrogim.” This continued for many years until Mr. Cray retired when he was well into his high 90’s, the contact man in Italy was then taken over by a Mr. Grimaldi, and one of his workers, a man by the name of Mr. Luigi Trifilio, in time also became a contact man in Italy. Being a follower of the Lubavitcher Rebbe, I asked the Rebbe’s advice and the Rebbe said YES. So in 1967 I became a partner of Rabbi Jacobson ob”m and traveled to Italy where he taught me all about checking the trees etc. to ensure the kashruth of the esrogim. 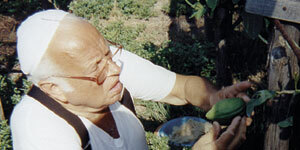 One very important rule was given to me by the Rebbe, that every esrog must be cut under the supervision of someone who is Jewish, acquainted with the trees (as for the origin and to check them to make sure that they were never grafted and 100% pure), and he also instructed me that two Jews should be watching the cutting to bear witness that the esrogim are 100% kosher and may be used on the holiday of Sukkoth. Rabbi Jacobson ob”m instructed Mr. Trifilio to continue working with me as I was his partner. 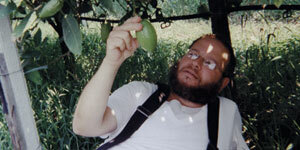 In 1980 Rabbi Hecht was joined by his son, Shea who is well versed and knows the laws concerning these trees, and since then (thank G-D) they are traveling together and bringing back the most beautiful and kosher Yanover esrogim to supply our brethren throughout the world. The Rebbe personally would receive us inside his office prior to the holiday to accept our esrogim, which we brought him for his personal use. 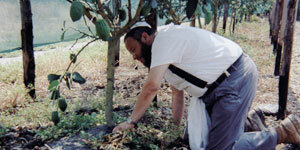 From the moment the esrog is cut until you receive it, it is under our strict supervision. 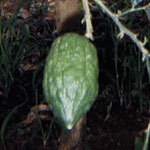 We also have a large selection of esrogim that are grown in Israel for your holiday use. Our service and quality of our arbah minim stands behind us for over 40 years, we hope you are confident in ordering from us, either online with our convenient easy to use order form or you can fax us the order at 718-258-5032. If you would like to speak to us please call the esrog center at 718-253-0882 or at our regular store at 718-258-9696. As in the past we offer special prices for bulk orders, synagogues, shluchim etc, please call us asap so we can fill your order without any problems. 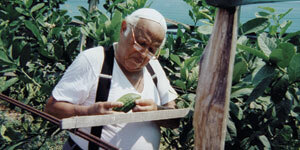 To learn more about the arbah minim follow this link.